Morning dawned clear, with heavy frost upon the trees and ice on the puddles. It was a good day to get our Alaska moose. We hunt the moose for food, not sport; without it, we would be eating a lot more pasta and beans. I like both, but not well enough for a staple. My wife Zoya and I own a sled dog racing kennel many miles from the nearest town. I have been here since I was a kid; Zoya came from the modeling runways of Milan, Italy. We stay because we love the country and the lifestyle. Of course, we aren’t the only ones who hunt moose in Alaska, and when the season opens, motor homes trailing four-wheelers begin rolling by our backcountry home, usually starting the evening before opening day. Some years, we have to look sharp before crossing the road. For my hunt, I just took the 4-wheeler down an old trail that led to Jack Phipps’ second camp. There aren’t many people alive who know where that is—maybe I’m the only one. Jack Phipps was a garrulous old Alaskan who leased Maclaren River Lodge on the Denali Highway back in the mid-60s. He ran a hunting service out of the lodge that included dropping off hunters at camps here and there. He later owned and operated several other lodges in the area, but the Maclaren was his love. He died of a heart attack while hunting on a lake just above his second Maclaren camp. He was a friend, and traveling his trails makes me think fondly of him. I parked the ATV and began easing through the trees. Maudie, our half-breed German shepherd, was at heel, or at least that is where she was supposed to be. I glanced back and she was stopped, head-up and alert, looking at a small herd of caribou on the far ridge. The group of cows and calves fed just below skyline on a brown esker. It took me a moment to pick them out. Whoever developed the theory that dogs can only see moving objects at a distance must work only with city dogs. Every good hunting dog I ever owned could pick out stationary objects and identify them, at least to 400 yards, nearly as well as I can. I will grant that most dogs need practice to accomplish that. The wind was in the caribous’ favor, so Maudie hadn’t smelled them. We weren’t after caribou this day, so I clicked to Maudie and we continued down a faint track that led deeper into scattered timber. Visibility was only 20 to 40 yards most places. The willows were head high, and we moved slowly and stopped often. It takes a while to get the feel of the land you are in; smell is a part of this, and also a sense that can’t be put so easily into words. I believe dogs that live outdoors always have this feel, but it seems humans need to relearn it every time we enter the wilderness. Some hunters are moderately successful because they work hard, some have occasional success because they are lucky or maybe just own very good equipment. But those who usually get what they are after wait and watch—they are able to blend into the land. Maudie and I settled on a knoll that overlooked a willow-covered hillside. I imagined hunters of the past sitting on this same hill, waiting as we were. We sat for three hours, saw no moose, but were rewarded with the sight of two far-off bands of caribou feeding through a swamp; an eagle sitting patiently on a dead snag, waiting for who knows what; and a hawk hunting mice. I watched the hawk take four in less than an hour and wondered how many it could hold. Two ravens spiraled on an updraft almost out of binocular range; I wished I had their vantage point. The dog and I skirted along a ridge slightly north of an abandoned camp. Part of an old military cot poked out of the tundra—soon it, too, would be gone, recycled by the forces of nature. A mile or so farther along, we worked our way out to the end of a tundra ridge that gave a view of the hillside we had just traversed and the flat below. Almost immediately, I spotted a small bull moose standing, head down, near the route we had just taken. I felt no regret; it wasn’t a legal bull, anyway. Here, they need be either spike/fork, over 50 inches, or have four brow tines. In Jack Phipps’ day, you only needed to see horns; today, you need very good glass. A half-hour later, a small but legal bull stood, shifted position, and then lay back down. Within the hour several cows also showed briefly. I waited a bit longer, then thinking I knew the locations of most of the moose below, I began my stalk. Moose have a fair nose, not great, and they don’t depend on it. A careful hunter can stalk them downwind, especially if he comes down on them slightly to the side of the wind. But their ears are extraordinary, and they have good eyes. Don’t wear raspy nylon, and if one sees you, turn around and go the other way. Don’t stare at them—they feel it. Same as dogs, they have that extra sense, and it is very well developed. As big as they may be, they are still prey for the wolf. I went first to a close overlook of the willow patch where the moose were scattered. Another hour of sitting didn’t produce a sighting. I knew I hadn’t spooked them; it was just too thick in there, and my viewpoint was not the best. I climbed back up my spotting hill. I was 10 miles off the highway and a long 3 miles from motorized transportation. There was about three hours of daylight left, and I would have been comfortable spending the night, but I had told Zoya I’d be home, so home I must go. Two cardinal rules when hunting up here are to never go home while it still is light enough to shoot, and if you still have gas in the tank, you didn’t go far enough. I’ve been accused of pushing both of these rules pretty hard. I waited, watching. Good things come to those who wait. A dark hummock about 400 yards to the south finally moved and became a moose, a large bull with 60-inch-plus antlers. Then two cows materialized from the willows around him as if by magic. I had a good rest and was in shooting range; that bull sure looked like meat for the winter. However, I never shoot a big animal without considering what will follow, and this was a very, very big moose, in an extremely tough spot. It would be a mile uphill pack through heavy willows to the closest location I could get the four-wheeler. I decided we really didn’t need that much meat and reluctantly came off the hill. When I got back to the ATV, I noticed the fuel selector was on reserve, and it was past shooting light when I arrived at the kennel, so I guess I kept things well within the rules. Kennel work kept us busy the next several days. But then I was finally free to get out and look for moose again. This time, I walked from home, and by first light, I was perched on a good glassing spot. No moose the first half-hour, but over the next hour I spotted seven within a mile. Two were bulls, resting together, one of which appeared to have good brow palms, maybe four brow tines. It would be a downwind stalk with minimal cover. I took off my coat and tied it under my sweatshirt. Like I already said, you can move on moose downwind, but you must keep quiet. I have seen moose lay calmly without reacting to a rifle shot within a half-mile. Then the same animal will jump and run at a rustling noise it doesn’t recognize. Maudie knows how to creep along with me, and she recognized a serious stalk. We came off the hill, her nose bumping my heel. When we were within 500 yards of the bulls, I started crawling. The brush was thick and shoulder high but with good going underneath. When I felt we were within 100 feet, I stood. The moose were lying down; but they heard me and came up quickly. It was easy to see four brow tines at less than 50 feet. I shot, and the work began. It takes a while to properly butcher a moose. An average adult bull weighs about 1,000 pounds, and we save everything from tongue to tail. When I finished, all that would remain on the site would be the stomach—even the hooves would go back to the kennel. When a moose is down in an easy spot you can turn it on its back using the long legs for leverage. I was lucky, it was dry here with good footing. Too often, it seems, moose are shot in swamps or at the edges of ponds. This was a healthy one; I cleaned 35 pounds of fat from the intestinal cavity alone. The heart, liver, kidneys and tongue were set aside on clean moss. The natives always cleaned out the intestines and saved them, too. In fact, many still scoop out the blood from the body cavity to fry. I have done that, but have yet to convince Zoya that it is an edible part. Of course, she feels the same way about the liver. Maudie seemed disinterested in all I was doing. A woods-wise dog is almost never excitable around a kill; they may patrol the immediate area, burying the small tidbits and pieces that are tossed aside. I did own one dog that liked to steal the heart; of course, this same critter buried my spotting scope on another hunt. It took just under two hours to ready the moose for the trip home. 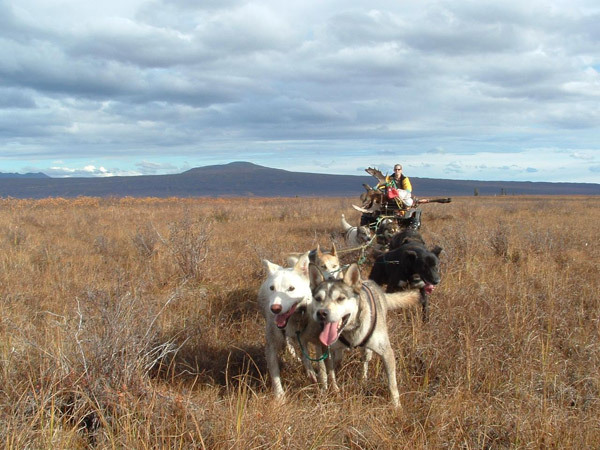 We were a couple of miles out, but by using the Honda ATV with eight or nine sled dogs hooked to it, we could cross swampland and steep hills the ATV alone would never negotiate under such a load. It is not wise to leave an animal on the ground for very long in the Maclaren country. We have a fair amount of grizzlies, and they can smell a kill from a long ways off. I returned home, told Zoya the news, hitched up nine dogs, and headed back out for the moose. The going was good, and we were able to move the entire animal in two trips. We would have meat well into spring.